The week is flying by for me! Does anyone else feel totally unprepared for Christmas, or is it just me? If you haven't, and know of someone who likes to read about historical wartime/romance, then Worth Fighting For by Mary-Anne O'Connor might be one to consider buying for them. 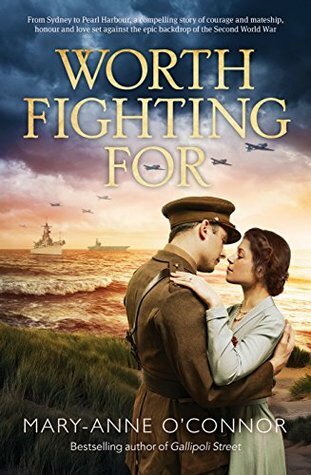 Worth Fighting For is set during World War Two. The main character is 18-year-old Junie Wallace, who finds herself in the unfortunate position of having to marry a man that she doesn't love or care for, Ernest Farthington. With two of her brothers away fighting in the war, and her third brother recently killed in action, her parents have fallen on hard times. They are indebted to Ernest, so it is up to Junie to help save her family's farm. Sadly, the only way she can do that is by becoming Mrs Farthington. Ernest is a man who is selfish, egotistical, and inconsiderate of Junie's feelings, so it is only natural that Junie doesn't want to be with him. What makes this marriage proposal even more upsetting for Junie is that she is in love with a drover by the name of Michael Riley. Michael is a real gentleman, and I liked his character very much. When Michael makes the decision to enlist, Junie has one last opportunity to spend time with him, and what plays out will change both of their lives forever.. The beginning of the book is set in Junie's hometown of Braidwood in New South Wales, but as the story progresses, we get to visit Darwin, Hawaii, Port Moresby, and Papua New Guinea. The story spans from 1941 - 1949, and it is quite a saga, at over 400 pages. I don't usually read this genre of fiction, but I did like the way Mary-Anne O'Connor describes the settings and surroundings throughout the story. Additional things I like are the captivating front cover, the strong focus on mateship and hope, and the author's acknowledgments, as we discover Mary-Anne's own family wartime experience. She even named characters in the book after her family members, which I thought was a very sweet sentiment. I would've enjoyed the story more if there was a greater focus on the romance element, as opposed to the main attention being on war, but that is just my personal taste. Overall, I would recommend this book, particularly if you like historical/romance war novels. I was not paid for this review. All opinions are my own, and not influenced in any way. I'm incredibly unprepared for Christmas, though thankfully I don't have to buy many presents. I've started doing a 'books for Christmas' post which you've reminded me I need to finish. And I imagine there are a lot of wartime romance lovers out there! That sounds like an interesting read! I like the different locations where it's set and it's quite a fascinating time period to explore.